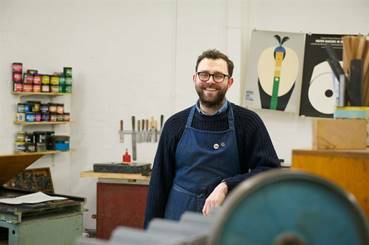 Based in what was once the heart of London’s print industry, the London Centre for Book Arts (LCBA) is an artist-run, open-access studio offering education programs for the community and affordable access to resources for artists and designers. 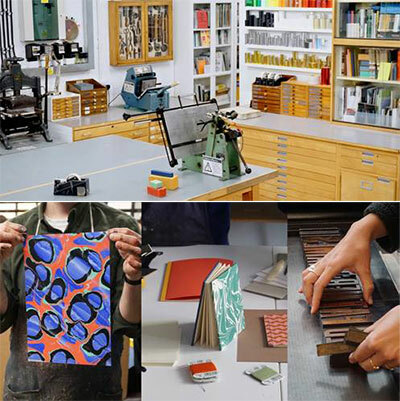 The Centre’s mission is to foster and promote book arts and artist-led publishing in the UK through collaboration, education, distribution, and by providing open-access to printing, binding and publishing facilities. The unique facilities at LCBA are available to everyone regardless of background, education or experience. After several years of planning and acquiring hard-to-find equipment and machinery, the studio was established in October 2012, becoming the first and only center of its kind in the country. Collins Library owns a copy of their first book, Making Books, a useful and extensive printed companion to their popular bookbinding and printing workshops. Students in our Makerspace have used their bookbinding kit. Join us for a wonderful afternoon to meet these two visiting artists.